Remnants of Tropical Storm Rosa have brought major showers to the Valley, with more than an inch recorded at Sky Harbor Airport since the system moved in on Sunday. As of 8 a.m. Tuesday, the official airport gauge had picked up 1.21" just since midnight! Meteorologist Iris Hermosillo says the main batch of rain is moving in Tuesday and will stick around for most of the day. A Flash Flood Warning is in effect for most of the Phoenix area until 10:30 a.m.
Tuesday morning: We've seen more than an inch of rain in the Valley since midnight. Phoenix has already broken the record for the most rainfall ever recorded on this date, and that number continues to climb! Steady rain will continue throughout the morning. Tuesday afternoon: We could see some clearing, helping thunderstorms develop. 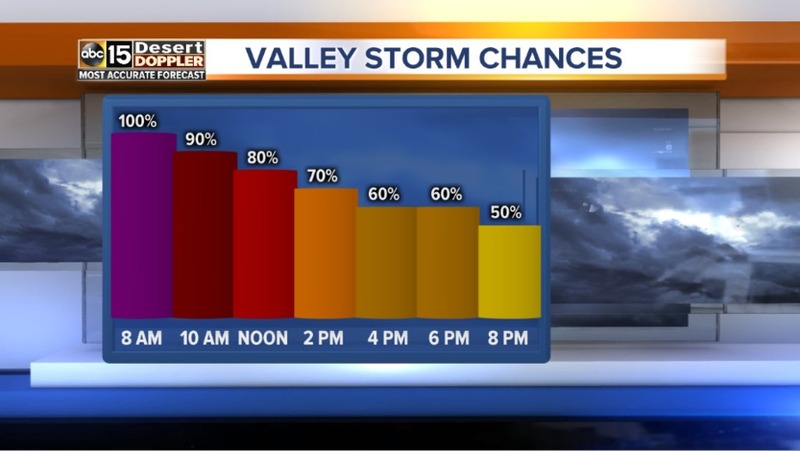 Rain coverage won't be as widespread, but scattered storms could bring flooding rain. The high will be in the low 80s. Tuesday night: Showers could linger into the overnight hours. When all is said and done, the Phoenix metro could end up with just over 2 inches of rain. Wednesday: The chance of rain decreases to 30 percent as another disturbance moves in from the west. It will be a brisk start to the day -- around 70 degrees -- but our temperature bumps up a bit in the afternoon to 88 degrees. Flash Flood Watches are in effect until through 5 a.m. Wednesday for the Valley, and all of central and western Arizona. Stay safe and do not attempt to cross any flooded roadways. Thursday: The effects of Rosa in Arizona finally die down. Expect mostly sunny skies and a dry forecast, but there is a slight chance of rain over the weekend as another disturbance moves in. Meteorologists Amber Sullins, Iris Hermosillo and John Patrick will be tracking the storm minute by minute. Watch ABC15 News and download the ABC15 mobile app for the latest developments.